I recently had the opportunity to take out an R1200GS Touring Edition (fully optioned) for two hours. In the rain, at that… Wow what a machine. 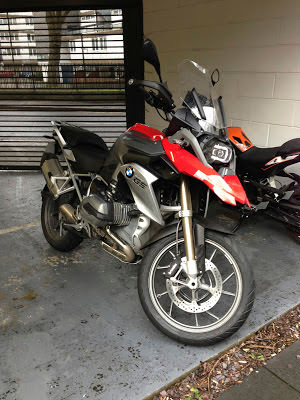 Compared to my F800GS it is loud and hugely more powerful. The engine is a touch rougher (more alive?) at idle but slightly smoother when revving, and the hydraulic clutch is far lighter than the cable clutch on the F800GS. That said, it is like a hair trigger which means a few stalls until you become acclimatised to it. The boxer engine sounds bloody amazing—throaty and resonant—and the cylinders don’t stick out much further than my legs so there wasn’t much difference squeezing among cars when filtering. The semi-active suspension is, in general, firmer than the soft F800GS. The bike feels well planted and the telelever front suspension greatly reduces dive under braking. You sit far lower to the ground than on the F800GS and whatever magic those crazy German engineers have done, they’ve managed to mask the extra 25kg, as the new R1200GS actually feels lighter than the F800GS in low speed manoeuvres (the previous R1200GS, in my opinion, was a lumbering beast). The ride-by-wire throttle programmes feel tangibly different. Rain mode makes the throttle feel gentle and slightly lazy, road mode feels roughly as responsive as the cable-operated F800GS throttle, and dynamic mode feels almost hyperactive. For obvious reasons I didn't try enduro or enduro pro modes. The cruise control was flawless at 30mph—no driveline lash. I didn’t get a chance to try it on any faster roads due to the short time I had the bike. The LED headlamp is an amazing and practical piece of tech for a dual sport bike, as LEDs are highly resistant to vibration. The daytime riding light gives the new R1200GS a strong identity on the road and is beautifully executed with even lighting all the way round its contour. Subjectively, car drivers seemed to shift over in their lanes to make room compared to when I'm on my F800GS, which means the unique lighting seems to deliver on its promise of extra visibility. When the dipped beam comes on (either manually via a switch, or automatically via light sensors), the daytime riding light fades to roughly 50% intensity. I seriously considered getting my F800GS appraised for part exchange. However, I would never buy a first model year bike—by the second model year, the worst of the bugs should have been identified and resolved. Interestingly, going back to my F800GS did not feel like a downgrade at all. It felt like ‘home’ so to speak… familiar and comfortable. Powerful but in a much more discreet way. As lovely as the new R1200GS is, the F800GS stands up well and is definitely the more capable bike on the rough stuff. 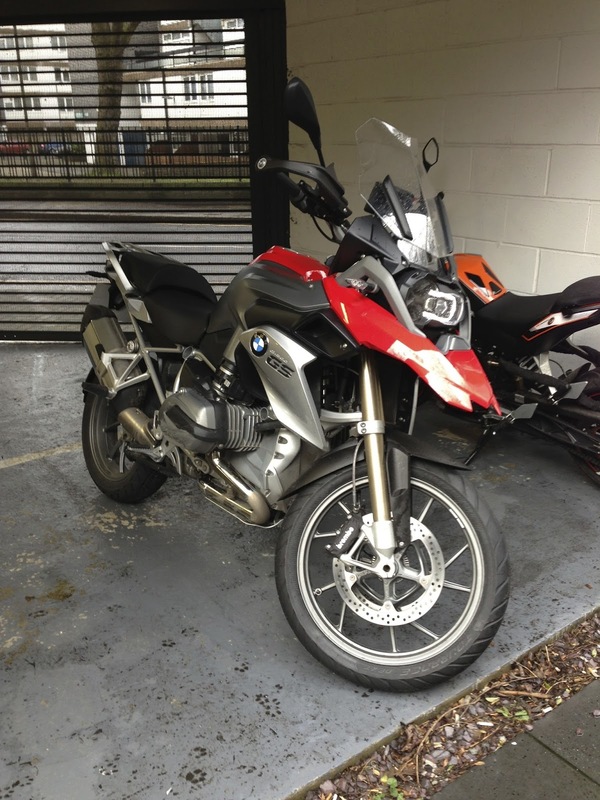 In retrospect, when my F800GS is 3 or 4 years old I think the R1200GS might just be my next bike, but it’s not quite time to exchange it.